Batch convert CAD drawings from DWG or DXF file format to image files (JPEG, BMP, GIF, TIF, TGA, PCX). This is perfect if you want to publish your CAD drawings on Internet for example or if you want to send your drawings with email. The program saves every layout in an separate image file. The only thing you have to do is to select an output size for the images and an output folder. You can batch convert as many DWG/DXF files with one click as you want. 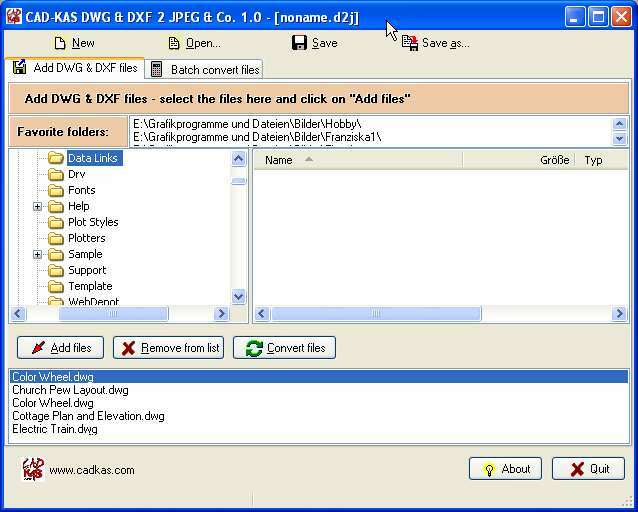 To convert dxf to pdf you can use DXF 2 PDF. DWG & DXF 2 JPEG & Co. has been awarded with the 5 stars award by software directory www.daolnwod.com. DWG & DXF 2 JPEG & Co. has been awarded with the 5 stars award by software directory www.softforall.com. DWG & DXF 2 JPEG & Co. has been awarded with the 5 stars award by software directory www.programjunction.com. DWG & DXF 2 JPEG & Co. has been awarded with the 5 stars award by software directory www.onekit.com. DWG & DXF 2 JPEG & Co. has been awarded with the 5 stars award by software directory BrotherSoft.com. BrotherSoft Review Staff give one product the maximum 5 out of 5 Rating because this product is easy to use, it has a professional-looking interface, it is excellent compared to other programs in this section and so on. DWG & DXF 2 JPEG & Co. has been awarded with the 4 stars award by software directory www.filetransit.com.